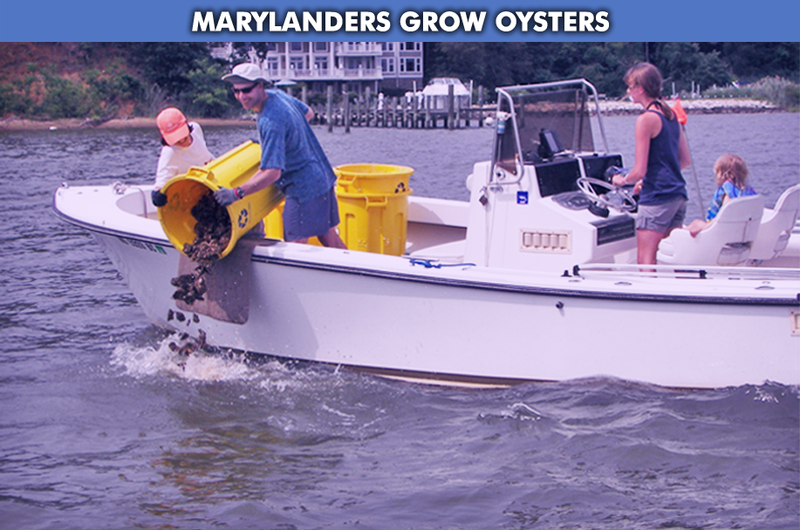 In 2008, Maryland created the Marylanders Grow Oysters (MGO) program as a means to enlist everyday citizens in the push to repopulate our rivers and the Chesapeake Bay with the Eastern Oyster — nature’s powerhouse water treatment system. 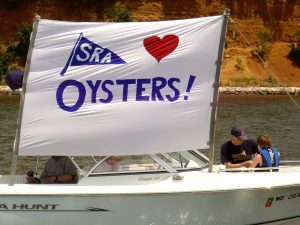 To be a volunteer, please send an email to SRAOysters@comcast.net before July 15th. 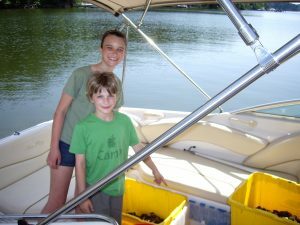 With mature oysters capable of filtering up to 50 gallons of water a day, the Severn River Association joined with the Department of Natural Resources and the Oyster Recovery Partnership to create an army of oyster growers on the Severn River. Our goal is to restore oyster reefs in the Severn River and plant millions, perhaps billions, of oysters in our river and let the oysters go to work. One day, we’ll have enough oysters to filter the entire river in a month, then a week and maybe one day, every three days — like oysters used to do. How To Become An Oyster Grower? It’s easy. Just hang oyster cages full of spat from a pier. The MGO program is easy. Our partners produce the oyster spat-on-shell every year at the Horn Point Hatchery in Cambridge, Md. ORP provides the oysters, cages and delivery. Then SRA helps distribute the oyster spat and cages to our team of volunteers who hang their cages from their piers during the winter hatching season (September-May). 2) visit your oysters once a month during the growing season (September-May) and tend to the cages by shaking them up a bit to knock off the debris to ensure a free flow of current can bring food to your spat. It’s easy. This quick video explains all there is to it: click here. Then during the summer, it’s time to clean your cages. Check out this video for a simple cleaning technique, click here. To be a volunteer, please send an email to SRAOysters@comcast.net, before July 15th. 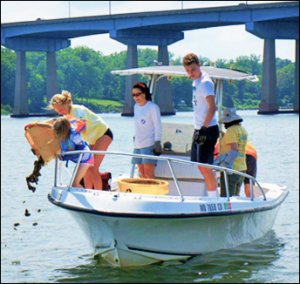 Severn River Association, Oyster Recovery Partnership, Maryland Department of Natural Resources, University of Maryland’s Horn Point Hatchery, and more than 400 volunteer oyster growers. To raise millions, perhaps billions, of year-old oysters and plant them in the river every year so the oysters can perform their natural and historic function — to filter the river and help create a resilient reef habitat that sustains oysters, fish and other wildlife. Currently, through the efforts of SRA’s volunteer oyster growers, the Severn River is home to over 2,000 MGO oyster cages. We’d like to see that number break 3,000 and then hit 5,000! Enhance conditions for fishing, swimming, crabbing, and other recreational activities. Raise public awareness about the land-river connection. Improve and increase marine life (finfish and shellfish) habitat. With your support, we can restore one of nature’s hardest working species and let them do what they do best – filter the water so that the Severn and its inhabitants can thrive now and into the future!